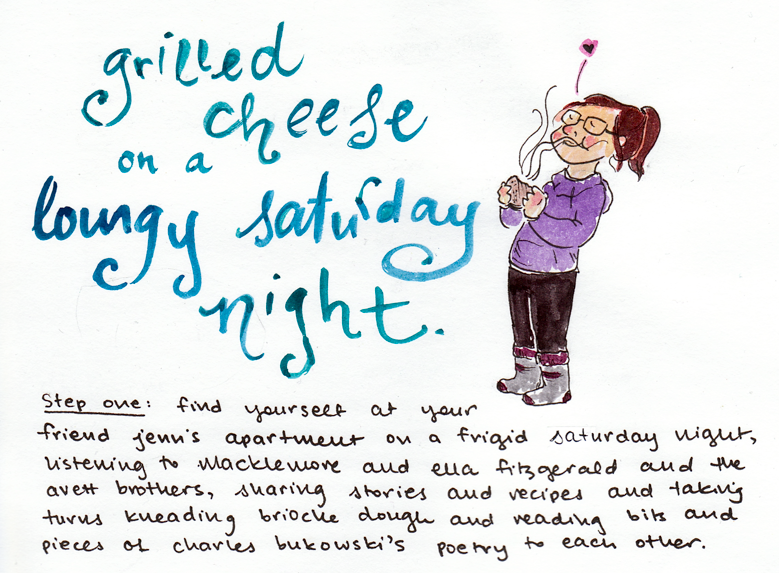 Recipes & comics, with a side of grilled cheese. I recently stumbled upon this list on Saveur’s website of ‘Recipe Comix,’ which is exactly what it sounds like. Saveur contacted several comic artists, asking each artist to draw a recipe for them. The collection of the works of art as recipes that resulted from this request are as varied as you could imagine. I showed this list to a couple of my friends, and I felt myself getting more and more excited about it each time I exclaimed, ‘Isn’t this just the coolest thing! ?’ Basically, it’s the most perfect combination of two of my greatest loves – art (especially comics), and food. The brilliant thing about asking various artists to draw out recipes is that it combines two aspects of human nature that allow for such uniqueness — as The Saveur states themselves, recipes are so much more than just a couple words on a paper. Recipes carry with them a wide collection of histories, emotions, perspectives and stories. And art, in a similar way, is a creative outlet that allows people to link themselves with others in the realization of collective emotions and experiences. Both the creation of art and food allow for incredible uniqueness – though we can cleave these things into smaller categories (appetizers, desserts, salads versus comics, sculptures, paintings) – each strain has, within those smaller categories, entire spans of possibilities. It’s just so fascinating and liberating, this ability to take this organizational slot – say, comics – and use it to develop a completely individual style. It’s liberating, yet at the same time, uniting. A melding of two potentially oppositional values, complimenting each other at the same time. Peanut butter and jam. A stocky George and a lanky Kramer. The uniqueness of art and food, coupled with the collectivity they can create. Every May, the TCAF (The Toronto Comics Art Festival) is held at the Toronto Reference Library. It’s this brilliant collection of comic artists from all over the world and is a really stellar chance to go see and support your favourite artists, but also to potentially discover some new favourites as well. Best of all, it’s easily accessible, as all the events are free to the public. This year, TCAF is going to be held on Saturday, May 11th and Sunday, May 12th, and I may or may not already be drooling in anticipation of exhibitors like Shelli Paroline, Liz Prince, and Lucy Knisley, who forever holds a special place in my heart. Knisley’s book, French Milk (a drawn-out travel diary about her trip to Paris, accompanied by mouth-watering drawings and descriptions of the amazing French food) was what originally launched me into my own love of comics and the art of storytelling through sequential art. This year, she’ll be debuting her newest novel, Relish, an artistic memoir of her upbringing by a family of foodies and her own ever-developing passion for food. It’ll include many illustrated recipes similar to the one she drew for The Saveur, and I’m already hopping with excitement. 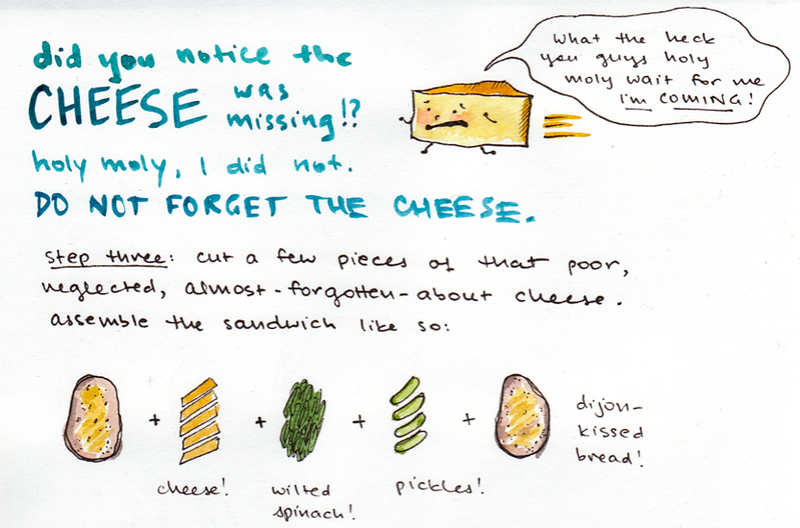 Inspired by the idea of Saveur’s Recipe Comix, I drew out my own little recipe after visiting Jenn the other Saturday night. I’ll let you in on a little secret — when you read this recipe, you get the impression that it was I who made the sandwiches, but in reality, I sat around and made Jenn cook for me. I’m a lazy gal, what can I say. Before you get the impression that I am a terrible house guest, though, I’d like to point out that I had to make my own tea because Jenn pretty much flat-out refused to make some for me. Terrible house guest, terrible hostess – we’re two peas in a pod. Jenn’s right – we have pretty much melded to become one super human! I want that food baby! The love of my life is cheese!!! This is an absolutely fabulous post, Natalie! Your drawings are superb and whimsical. Can’t wait for your next post! hahaha, I am SO glad you noticed.